We’ve added a new feature to ProSys! 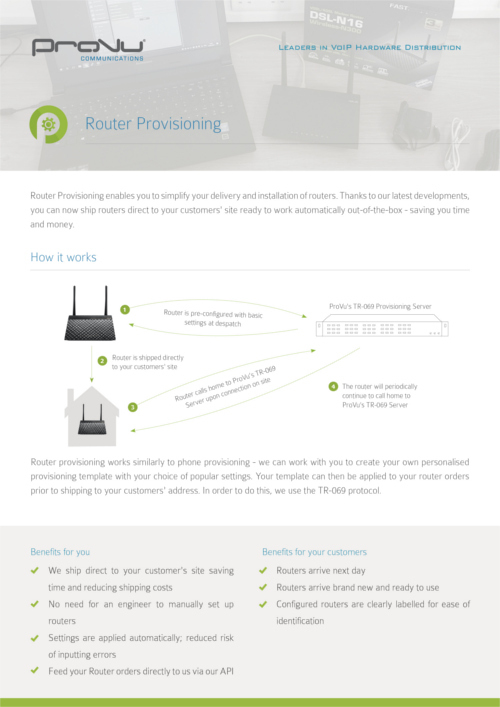 Thanks to our latest developments, we are now able to offer a router provisioning service on our new TR-069 provisioning platform, enabling you to ship routers directly to your customers’ site ready to work out-of-the-box. Enjoy your first provisioning on us! Our new service is so good, we’d like you to try it for free*! From now until the end of September 2017 we’re offering free provisioning when you purchase any of our routers. We’ll work with you to create your individual provisioning template free of charge – meaning you’ll be up and running for all of your future orders. To get started call us on 01484 840048 or email contact@provu.co.uk. *Please note: Free provisioning is only available between selected dates and is limited to 1 per company. To qualify, your company must not have used router provisioning before. Router and delivery are chargeable. Buy 5 Sangoma s700 IP Phones – Get 1 FREE! We’ve teamed up with Sangoma to bring our resellers a brand new promotional offer! Available throughout May and June, purchase five s700 IP deskphones and receive one for free. Sangoma’s s700 IP executive-level phone offers a feature-rich device. With 6 SIP accounts, 5-way conferencing, 45 programmable soft keys and a 4.3″ full colour display, the s700 marks the most advanced model in the Sangoma phone range. How Sangoma s700 is different to the competition? Out-of-the-box Zero Touch Provisioning – Only Sangoma provides Zero Touch provisioning with FreePBX / PBXact. EndPoint Manager included – Lets your users control global settings, program their phone keys, map extensions, upload images, download new firmware, and much more. Full Integration with Phone Apps – Enables users to easily control complicated features directly from their phones. We’re proud to be sponsoring the Channel’s newest event! Join us in London on Tuesday 25th April for the first ever Channel Leaders Conference. Aimed at ICT Reseller Businesses, Channel Leaders is designed to combine practical knowledge with forward thinking strategic advice and discussion on how Channels can remain relevant to their customers both in the short term and in the future. Throughout the day, you will have the opportunity to attend seminars and panel discussions from respected analysts and commentators – it’s a great opportunity to hear from Channel Leaders! Tickets are available through the Channel Leaders website. To save 50% simply get in touch and we will provide you with our exclusive discount code. But hurry, tickets are selling fast! We have a great bundle offer available for our reseller partners giving you a FREE DECT Manager when you buy 4 of more Gigaset N720 IP DECT base stations. To take advantage of this bundle you will need to contact the ProVu sales team. The Gigaset N720 IP DECT multi-cell solution offers its users seamless handover for uninterrupted calls – perfect for large areas and multi storey offices. Gigaset’s multi-cell systems are expandable for up to 30 base stations, enabling use for up to 100 handsets. Plus with a great choice of affordable handsets this solution is very flexible, allowing you to meet both the needs and personal preferences of your customers. Exclusive money saving Snom 3CX bundles! Offer extended till the end of June 2017! We’re delighted to bring our 3CX partners a brand new, exclusive bundle promotion! Available until the end of May 2017 and whilst stocks last, you can now save up to £150 when you purchase a 3CX licence with any mix of Snom desk phones from ProVu – saving you £10.00 per phone! Simply call the ProVu sales team on 01484 840048 or email contact@provu.co.uk and quote the bundle code you require. Please note: bundle pricing is only applicable to new 3CX purchases and is limited to a maximum of 15 desk phones per order. ProVu will require end user details for each bundle purchase. From now until the end of April 2017, we’re giving our resellers the opportunity to purchase any Verso or Force intercom with a 2N tamper switch and receive a free gold licence, saving you £126.00! Available with a variety of options, there’s a 2N intercom to suit you. The Force offers an exceptionally sturdy option, whereas the Verso offers a more stylish, modular option. For increased security, 2N’s tamper switch can be configured to send out an alert to a security system if the intercom’s front plate is removed. Gold licences enable you to unlock a range of enhanced video, audio, security, integration and NFC features, adding increased functionality to intercom units. To take advantage of this great money-saving offer, simply call the ProVu sales team on 01484 840048 or email contact@provu.co.uk and quote ‘2N bundle offer’. Promotion: Buy a Yealink CP860 and get two FREE mics! From now until the end of 2016 you are able to get two free CPE80 expansion microphones with your purchase of a Yealink CP860 conference phone. This offer is not available on ProSys so please contact a member of the ProVu Sales team to take advantage of this offer. This promotion is available to all ProVu registered trade resellers. If you are an ITSP, telecoms reseller or security installer and would like to become a ProVu reseller please fill out our new reseller form. This offer is only available whilst promotional stocks last. Following our recent launch of Sangoma’s new PBXact UC Systems and IP phones, we are pleased to announce a special introductory offer. Available until the end of 2016, we invite you to experience this fully featured solution at a great price. Bundles can be built to suit individual requirements, products included in the offer are: UC10, 60, 100, 300, 1000 and 5000 systems and any mix of the s300, s500 and s700 phones. Designed to work seamlessly with all Sangoma phones, Sangoma’s PBXact UC comes pre-loaded with many advanced commercial features including call recording reports, conference pro and voicemail reports. Bundled together with Sangoma IP phones, this powerful solution unlocks the power of secured zero-touch provisioning by automatically configuring the phones when they are connected to the network. Please note; all purchases of Sangoma PBXact UC systems require an annual support package. This promotion is available to ProVu registered trade resellers. If you are an ITSP, telecoms reseller or security installer and would like to become a ProVu reseller please fill out our new reseller form. To take advantage of this bundle you will need to contact the ProVu sales team on 01484 840048 or you can email: contact@provu.co.uk. These promotions are available to all ProVu registered trade resellers. If you are an ITSP, telecoms reseller or security installer and would like to become a ProVu reseller please fill out our new reseller form.